Varese, 5 th November 2018 – Racing is the ultimate test bench of every engineering design, the unrelenting battlefield where every component is stressed to the extreme, pushed to the very limit. It is the “laboratory” where new technical concepts are taken to be experimented with and, in some cases conceived, with the sole focus of achieving the maximum possible performance. Power output must be strong and explosive, while the electronics must be extremely refined to allow the rider to harness all the power, bending it to his will. This introduction is necessary in order to understand the essence of the all-new Brutale 1000. Closely associated with the F4 RC Superbike, which has proven its potential battling for the top positions in the World Superbike Championship. All the experience that has been accumulated on the racetrack has been poured into the engine of the Brutale 1000 Serie Oro, which sets new records for absolute power while still complying with pollution and noise regulations, making it more advanced in certain aspects than the competition powerplant. 153,0 kW (208 hp) at 13.450 r.p.m. Progressive, single shock absorber Öhlins TTX. 115,0 Nm (11,7 kgm) at 9.300 r.p.m. The unmistakable Brutale design cannot depart from such strongly characteristic elements as the headlight, fuel tank and tail fairing, all of which were custom designed and engineered for this model. 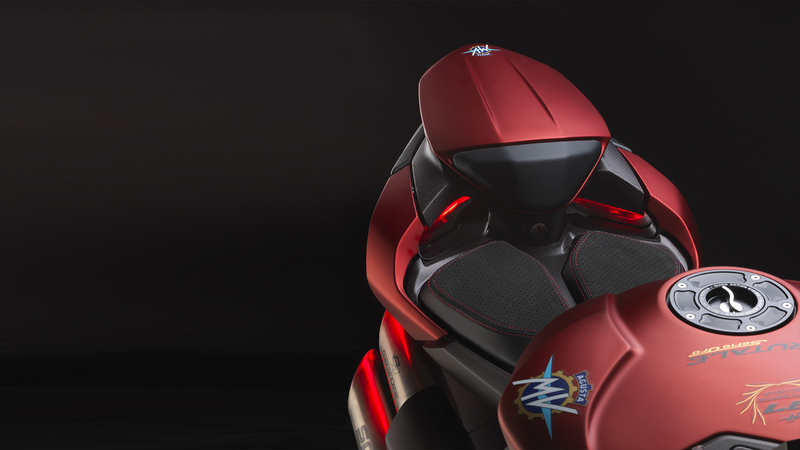 The design is a tribute to the MV Agusta heritage all the way back to the very first Brutale. The headlight is Full LED and can rely on Cornering Lights, controlled by the inertial platform and able to illuminate turns based on the lean angle, all beneficial for safe riding. For the first time on a bike, the internal part of the headlight unit is coloured and forms an “X” shape that the steering base also takes on. 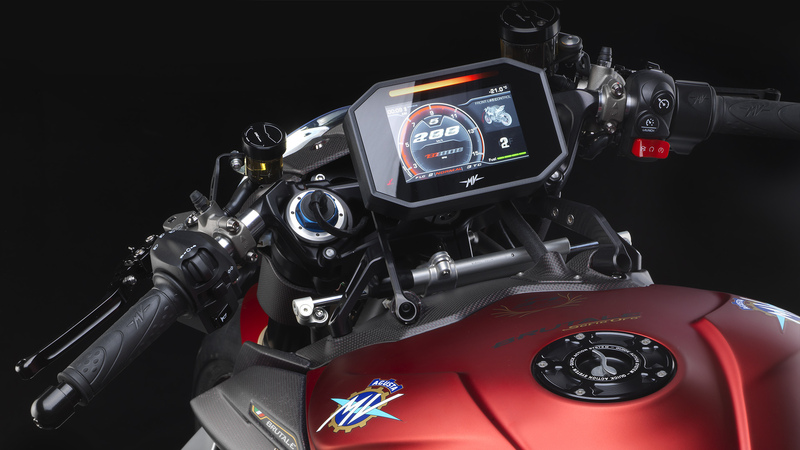 The four-cylinder engine does not betray MV Agusta tradition in terms of technological choice, but it does open a new chapter were materials, design and electronics are concerned. A painstaking job that has led to a record peak power of 208 hp at 13,450 rpm with a torque of 115.5 Nm. These incredible levels make this engine one of the most powerful naturally aspirated four-cylinder engines in production and the Brutale the most powerful naked sports bike in the world. With the dedicated racing kit, consisting of an engineered SC-Project titanium exhaust system and dedicated ECU, the maximum power is increased to exceptional value of 212 hp (156 kW) at 13,600 rpm. All of the vital engine and electronics functions are displayed on the 5-inch colour TFT dashboard with 800 x 480 pixel resolution. The riders smartphone can be connected via Bluetooth to the dashboard to manage incoming calls, texts and music. The purpose of its particular arrangement above the fuel tank which is fitted with a locking cap made from billet – is to make the front end even more compact and aggressive. 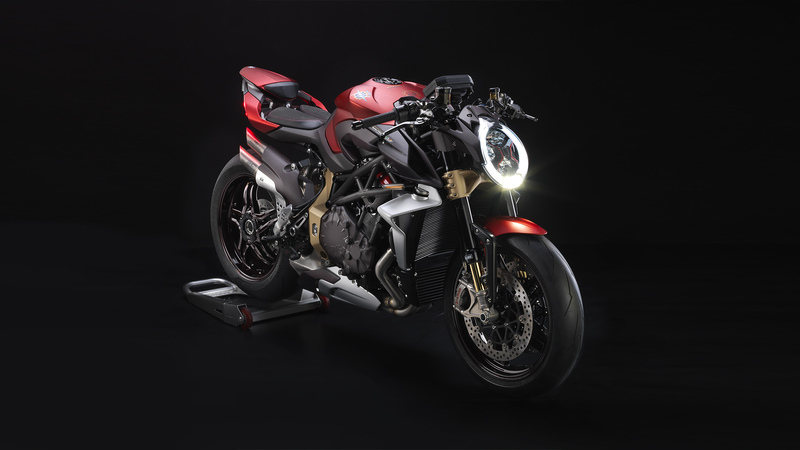 While the F4 RC was the starting point for developing the engine in the all-new Brutale, MV Agusta’s heritage is evident in the chassis architecture. 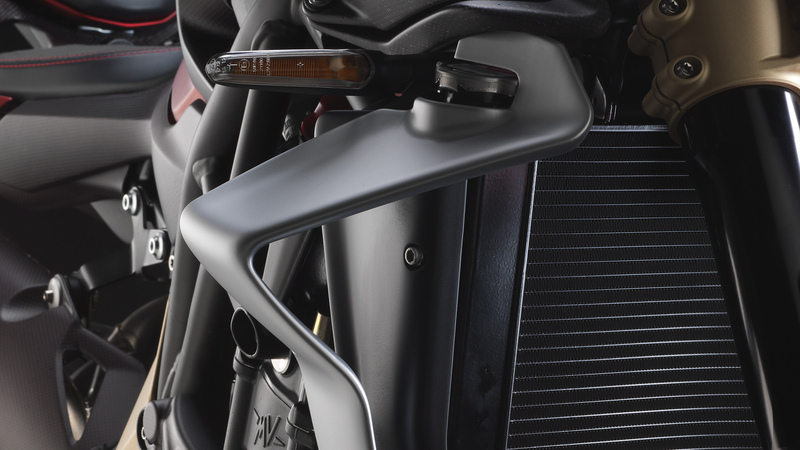 Pioneers of the “composite chassis structure” with steel trellis connected to aluminium side plates, MV Agusta has maintained this engineering concept – also applied to the new Moto2 bike ready to compete in 2019 – but evolves it significantly on the Brutale 1000 Serie Oro.